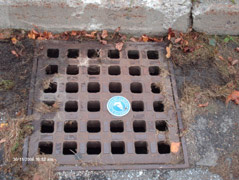 Storm drains provide an avenue for stormwater runoff to travel directly to a major body of water (i.e. Lake Champlain). Unfortunately, they also provide an avenue for pollutants to reach the water. Dumping oil, paint, or other waste down storm drains can have devastating effects on water quality. 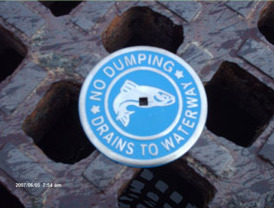 Specially designed markers have been bolted to storm drains all over South Burlington warning people not to dump their waste down the drains. These markers are intended to remind people that waste poured down storm drains flows directly into important water resources and can damage water quality. These markers are intended to reduce the amount of contaminants deliberately dumped down storm drains. This will improve water quality and allow us to safely use and enjoy our water resources.